Earrings for earrings making, or the joy of creating jewelry individually. Sterling silver earrings are the most feminine jewelry, because it adds glamor to the person who wears them, and also gives a subtle elegance to every creation. The type and length of earrings depend on the person's preferences. Thanks to the ear tag, you can create your own, individual and unique jewelry that will look phenomenal. In the performance of such earrings will help, apart from earwires, also various types of beads and decorative stones as well as jewelery tools. When buying earring findings and beads necessary to make earrings, it is worth remembering that such a small thing is a perfect idea for a mother, grandma or friend. In addition, by creating earrings, you can gain absolute certainty that each project is unique and unique, while the work on jewelry itself is great fun for people of all ages, which allows for integration, laughter and development of creativity. In any case, the effect is dazzling, and jewelry, characterized by exceptional durability, will enjoy the eyes for many years. 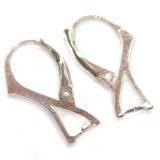 A wide range of jewelry findings components used to make earrings is mainly silver ear wires. The offer includes hooks fastened, that is, which can be easily applied, for example, a glass beads or a previously made ornament consisting of several wooden beads connected with wires. Such long earrings are an excellent addition to, for example, a necklace and bracelets consisting of elements of similar shapes and colors. Ear wires with a ball or with springs are earwires with an ornamental character. In addition to beads, also aesthetic elements, permanently mounted in the structure of the semi-finished product, play a decorative role. Fish hooks are extremely expressive and just hang a small element on them, such as a pendant, to get a spectacular visual effect. Slender hooks will look great if a large decorative circle is placed on them. These earrings are great with a summer stylization, consisting of a long skirt and a loose blouse or a flowery dress. Our store also has silver earwires for earrings that have a special pin designed to keep Swarovski crystals. The assortment includes silver earwires, which can be installed, both quite large crystal beads, as well as smaller ones. The bolts effectively prevent falling out of the crystals. Thanks to the silver earwires with the pin and Swarovski crystals, you can conjure up a beautiful, timeless and original jewelry, which will be perfect as an addition to the evening dress. The crystals shine beautifully, reflecting the light, and emphasize the feminine beauty. Earrings with these beads is a hit and elegant gift for every lady. Earring findings for making earrings where to buy? Welcome to our store with semi-finished products for making jewelry, after the purchase of silver earwires. We sell different types of earwires for earrings, including earwires, simple earwires and open earwires. Everything at the best prices, with high quality. Perfect for making earrings or repairing damaged jewelry. Let's start with the bigli - this is the colloquial name of the earrings fasteners, i.e. semi-finished products for making jewelry. Earwires differ due to the material they are made of, or the types of their endings. We distinguish silver, gold and platinum hooks. Also available are silver-plated hooks or gold-plated earwires. The most attractive prices are metal fasteners in silver or gold. However, artists who create handmade jewelry usually choose silver earwires, because of the quality and affordable price. The types of earrings are different due to the fastening technique that suits us. 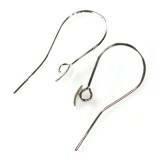 That is why we have very popular silver earwires open to longer earrings. They differ in the angle of bending the wire, which translates through the ear. However, the more simple ones can fall out of the ear, so we have open hooks with a spring, or open earwires with a ball. In addition to being a decoration, the ball also protects the earring against unexpected slipping of the ear. In addition to the silver open earwires, we also have silver earwires closed with a simple one, differing only with the hook located at the bottom of the fastening. It closes the contoured wire and protects the earring from its sudden slipping. However, this type of hook is designed for larger earrings. 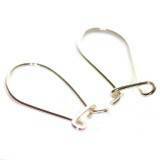 Another type of earwires are very popular recently in English silver clasps. Certainly you have repeatedly met with an earring, which translates through the ear, closing it with a rotating cap at the back, on a small hinge, until you hear a characteristic snap. Bigiel English is the most comfortable clasp. However, for the creators of earrings with Swarovski crystals, silver earwires with pins will be the best, in which the pearls or Swarovski pendants are placed. 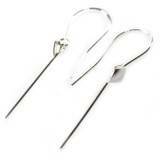 The most popular form among the fastenings of earrings are sticks, otherwise known as a lamb. It is a pin clasp - a silver straight section of the material, which translates through the hole and protects the back of the ear with a silver plug, so-called. lamb with characteristic curves on the shape of ram's horns. The great advantage of silver earrings is that you can sleep in them and not be afraid of being deformed. In addition to the above-mentioned crevices, we also have so-called silver suspensions (chains) - a thin chain is slung over the ear and ends with a decorative part that locks on the ear. The silver ball placed in front of the hole of the hole serves as a strengthening before the chain from the ear comes out. The last fix I am about to write about is the silver clips worn by our grandmothers, which have recently got new life from the jewelry makers. They can also be worn by people who do not have pierced ears. Their construction consists of two elements: a plaque and a wire holding on to the ear.